Perhaps Cinsaut is no different from any other grape – some from very special sites (Badenhorst’s Ramnasgra ir Sadie’s Pofadder, for instance) will scale the heights of greatness, others will be be enjoyable, everyday drinking and still others will be a bit simple. 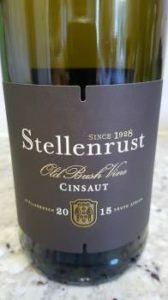 Stellenrust Old Bushvine 2015 seems to fall in the middle category. From a 1964 vineyard, fermentation occurred in concrete tanks before maturation lasting 16 months in French oak, 10% new. On the nose, strawberry, fynbos and earth. The palate is medium bodied – juicy fruit upfront before a very spicy finish. Great with kettle-braaied chicken. Wine Cellar price: R100 a bottle.